Happy New Year to each of you! Hope the new year brings you peace and joy throughout the year! 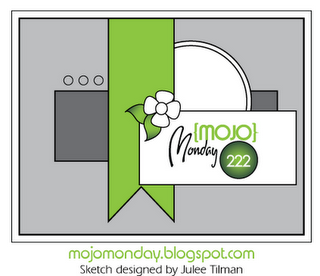 I decided to start out the new year with a sketch from Julee Tilman, MojoMonday222. Click here to find out more. The stamp set I used is from Verve called One Person. The designer paper is from Graphic 45 and The Paper Studio. Added some pearls, lace doily and a flower. I love this flower so I decided to take a close up shot. Your card is gorgeous and I love that flower! You followed the challenge much better than I did. Nicely done! I have a Nicole and our Richard was going to be a Nathan so it would go along with theNs Nancy and Natalie , Nicole. We changed it last min. Not sure, why. Beautiful card! take care, Nancy. Veryy pretty! I love the colors and doily!